Reading the Fantastic Four comics from the start. One of the most famous (infamous?) 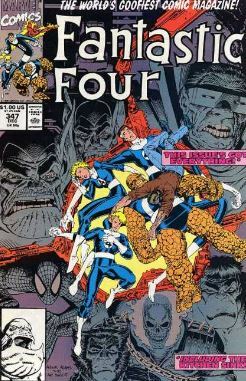 FF stories of the 90s is the New Fantastic Four (with a capital N), which begins in issue #347. 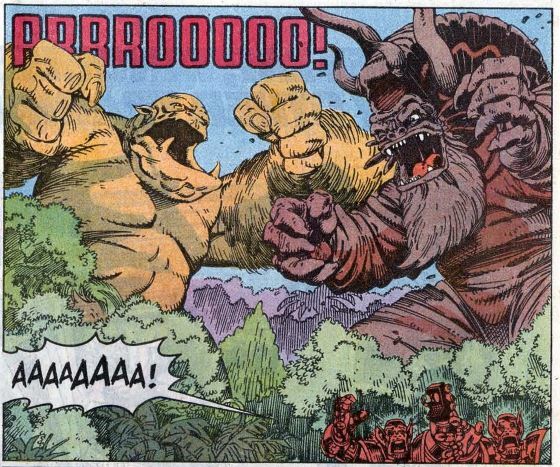 Art Adams temporarily takes over artwork duties from Walt Simonson, who is still scripting. Adams brings his trademark cartoony style to FF. We begin with a damaged spaceship crashing on Earth. An alien woman, whose face we don’t see, survives the crash and swears revenge on those who forced her to come to Earth. At FF headquarters, Reed and Sue are playing with Franklin, who appears to have recovered nicely from the events of Days of Future Present. 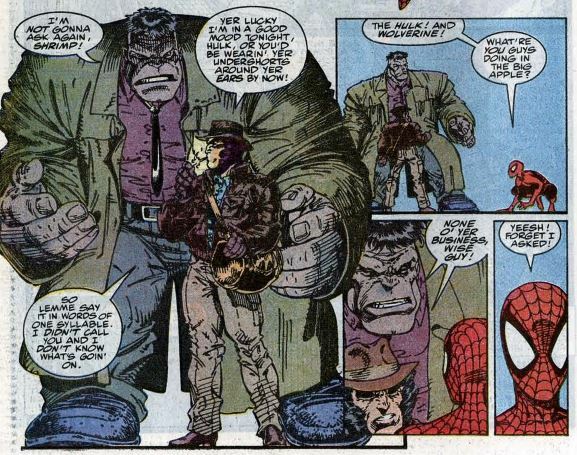 Johnny is spending most of his time in isolation, not speaking to Alicia (who is secretly Lyja the Skrull in disguise). This is because Johnny is still haunted by thoughts of Nebula, after she took over his mind a few issues back. Similarly, Sharon doesn’t want to spend time with Ben, because she’s having a tough time being a Thing after temporarily becoming human again in the last few issues. Out in space, a Skrull battleship is on the way to Earth. The Skrulls are in pursuit of a fugitive named De’Lila. Although not stated outright, it’s clear that De’Lila is the space woman from the opening scene. Back at HQ, De’Lila takes the shape of a beautiful woman to seduce/sneak her way past security. Using a stun device she wears as a ring, she works her way through the whole team. She shape-shifts as Nebula to stun Johnny. She shape-shifts as Alicia to stun Ben. She shape-shifts as Ben to stun Sharon, and she shape-shifts as Namor to stun Sue. Finally, she shape-shifts as Sue to stun Reed, but the stunner doesn’t work as well on Reed’s elastic form. They fight, until she succeeds in knocking him out. The Skrulls arrive on Earth, tracking what they say are some “Skrull-like” creatures. It’s all the monsters on Monster Island, which you’ll remember is the home of the giant creatures controlled by the Mole Man. The Skrulls use “slave darts” to take over the monsters’ minds and use them to help find De’Lila somehow. Underground, the Mole Man learns about this and swears revenge. At HQ, De’Lila is still in the form of Sue, sees a news report about giant monsters on the move, and she knows this means her pursuers have come for her. She starts researching other Marvel heroes. Later, Spider-Man shows up, saying his spider-sense has somehow drawn him to FF HQ. He meets Wolverine and the Hulk outside the building. They have similarly been drawn there. A security guard meets them at the door, saying Sue (really De’Lila) had summoned four heroes, and wonders where the fourth is. On cue, Ghost Rider comes riding up. 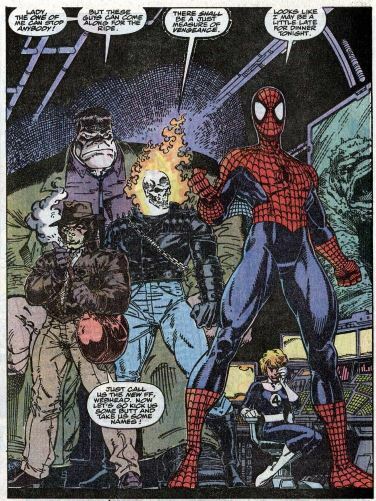 Note that this is Danny Ketch, the second Ghost Rider, who had just recently been introduced. The other characters don’t yet comment on this. There’s a little bit of action as Spidey, Wolverine and the Hulk chase Ghost Rider into the building. There, they meet De’Lila in disguise as Sue, who convinces them that Reed, Ben, Jonny, Alicia, and Sharon are all dead. 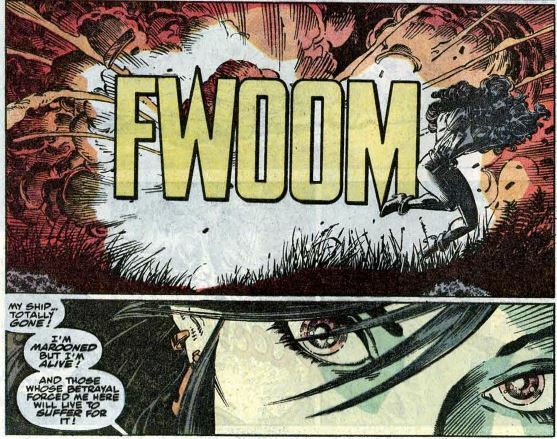 Ghost Rider kinda/sorta confirms this, using his ability to sense whenever innocent blood has been spilled. Unstable molecule: We see Reed in the lab, working on the Rad-D device, which kicked off the time-travel plot back in issue #337. He says his modifications will give time travelers an emergency exit immediately back to the present in case anything goes wrong. Fade out: Sue mentions she learned that Namor had recently devoted himself to saving the environment, referencing Sue recently guest-starring in Namor #3-4. Clobberin’ time: Ben buys Sharon tickets for the Desert Rose Band, a real-life country/rock hybrid band formed by Chris Hillman, formerly of the Byrds. Not sure why this reference made it into the comic, but okay. Flame on: Johnny is so overwhelmed with thoughts about Nebula that he burns up a book in his hands. Alicia/Lyja doesn’t seem too alarmed by this. Fantastic fifth wheel: This story arc finds members of the New FF just wrapping up some big stories individually. Spider-Man just recovered from the Powerless storyline that had him be an ordinary human for a while. Wolverine just got his freedom back after being a prisoner in Genosha during X-Tinction Agenda. The Hulk is here dueling three personalities — his smart-but-brutish grey form, good old Bruce Banner, and the classic “Hulk smash” green Hulk. Danny Ketch just recently became Ghost Rider, and is still mourning the death of his sister Barbara. Four and a half: Reed has a line of dialogue about giving Franklin “the power of his birthright.” I’m assuming this refers to Franklin absorbing the powers from his future self during Days of Future Present. Also, in Power Pack the same month as this issue, Franklin begins public school, where he’s smart enough to attend class with kids a few years older than him. 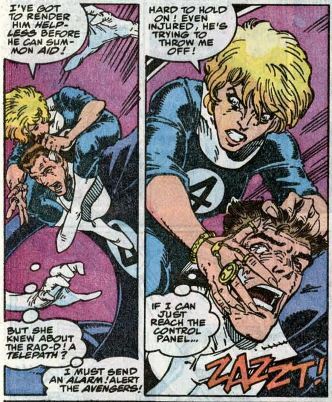 The Alicia problem: Lyja can tell right away that De’Lila is a Skrull, and De’Lila takes out Lyja with a punch instead of the stun device. Is it possible that De’Lila figured out Lyja’s secret? 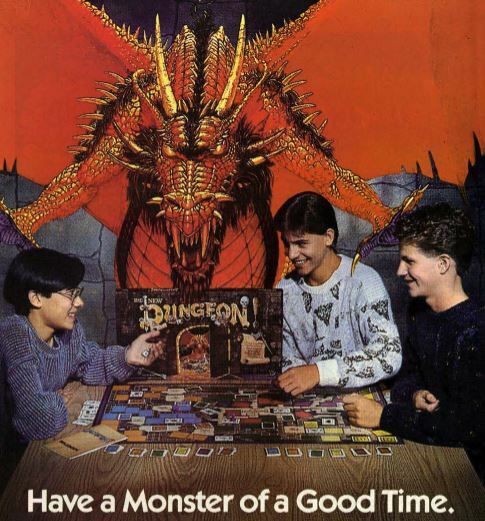 Commercial break: This game was prominently featured in an episode of Stranger Things. Now I really want to see the Stranger Things kids wearing these sweaters. Trivia time: It’s not mentioned in this issue, but all Skrulls have recently regained their ability to shape-shift. It happened in the second Kree-Skrull war, in which the Silver Surfer, the Super-Skrull, and Skrull Empress S’Byll restored their powers. Fantastic or frightful? Is this story arc an obnoxious cash grab, a mere excuse to get a bunch of better-selling Marvel characters in this book? We’ll dig deeper into answering that in upcoming issues. As far as this one goes, I’d argue that it does a good job up upping the stakes, making readers feel that four heavy hitters are needed. Next: Mutants and Hulks and demons, oh my.